I always like to remind my clients that fat loss is simple, but it’s not easy. Losing fat requires spot-on nutrition and proper training. I’m not here to tell you that there’s a magic formula that will get you results. You have to put in the work, but that doesn’t mean it needs to be complicated. One of the simplest tools for incredible fat loss is the kettlebell. Many people are familiar with movements such as the Swing, the Turkish Get Up or even the Clean and Press. These are all awesome exercises and can be used to build strength, stamina and overall conditioning. I’m a big believer in using kettlebells; we used them in our small group training sessions at the gym and I use them at least once a week in my own training. Today I want to give you a simple way to ramp up your results with this one tool. Enter the kettlebell complex. 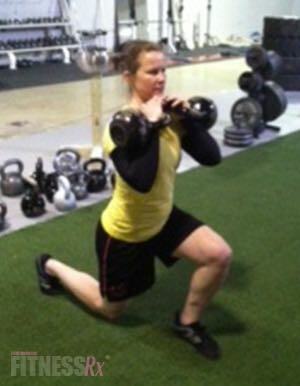 Kettlebells are a challenging and effective tool due to their dynamic nature. They aren’t better or worse than a dumbbell or barbell, just a bit different. The weight position of the kettlebell (below the handle) makes it tougher to control. You are also engaging your core a lot more than a dumbbell because the weight isn’t evenly distributed and each exercise requires you to move the bell faster to ensure correct technique. Kettlebell movements will recruit all the major muscles in your upper and lower body, as well as the core engagement that I spoke about above. These factors make it much more challenging when you do a simple movement like a press or a front squat. A complex is a series of movements that are strung together to create a full-body training session. You can vary the repetitions and sets based on your current level of fitness. You can also mix and match exercises but you want to make sure you select exercises that flow together in a smooth manner. The one thing to always remember about complexes is that you have to cater to the limiting exercise when you select your weights. Generally speaking, shoot for 3-6 total circuits with about 2 minutes rest between each circuit. You want to perform 5-10 repetitions depending on the exercise. Now that the boring mechanic portion of the story is over, I want to give you a simple (but not easy) kettlebell complex to kick up your fat-loss results. 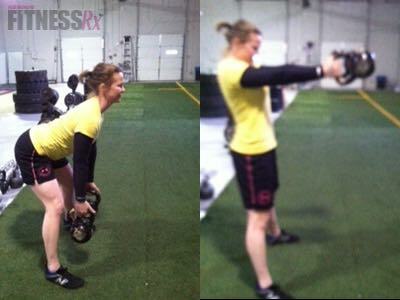 This complex is using double kettlebells (one in each hand). For this circuit you will do 5 total sets of varying repetitions. We’ll be mixing the reps depending on the exercise. The swing is one of the most basic kettlebell movements, but when you throw in two bells, you engage your core in a much more dynamic fashion. Set yourself up like a traditional two-arm swing but with a wider stance and hold one bell in each hand with your palms facing each other. Start in a deadlift position with the hips back and chest up. The bells will hang between your knees and palms facing your knees. Snap your hips up like a swing and quickly rotate your elbows and wrists, punching the weight up toward the ceiling. Catch the weights at your chest and re-tighten your abs, then dip and drive your hips up into the press. Bring the weight back down to your racked position (at your chest) with the wrists tight. 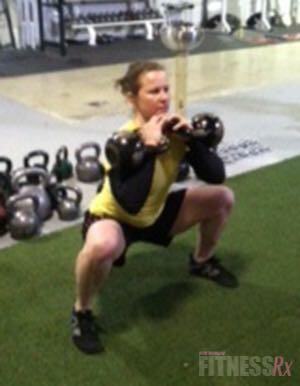 Drop the hips back and down into a deep squat, fire through the heels and drive up to the starting position. Start with tight abs and a slight knee bend to create a base of strength. Press the weight up overhead without any help from the lower body. As you press up, rotate your palms from facing each other to facing forward. Be sure to squeeze your shoulder blades to stabilize and recruit the upper back. Start the weights in the racked position and step back into a lunge with your right leg. Relax the back leg as you bend and drop your back knee, hovering just above the floor. Keep your core tight and drive up through your left heel to return to the starting point. Then step back with your left and repeat this action until you’ve completed 5 repetitions on each leg. The goal of this complex is to finish all the prescribed repetitions without putting the bell down. Move as fast as possible but maintain core tightness and perfect technique. Rest 2 minutes between each round and complete 5 total rounds.